Shopping for table linens can be a tricky business, particularly if you've asked yourself more than once, "What size tablecloth do I need?" Simply eyeing the table is not enough. There is a science behind the so-called "fine art" of choosing the right tablecloth. 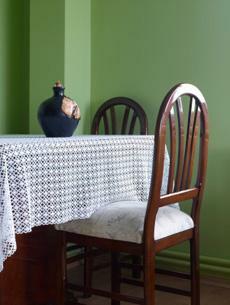 As anyone who has ever decorated a dining area knows, a tablecloth often makes the perfect finishing touch. It can serve to brighten up the space, provide contrast to a primarily dark or light color palette or simply change things up a bit for a fresh look. In addition to simply choosing a fun pattern or attractive color, proper attention must be paid to the size of the tablecloth. Choosing the right size is imperative for a number of reasons, not least because it will cover the table completely. If a tablecloth is too small, it can easily shift out of place. A small tablecloth also tends to look awkward, whereas one that fits well has a nice drop that falls symmetrically on all sides of the table. If you're asking yourself "What size tablecloth do I need?" and not exactly coming up with the right answer, not to worry. There are some basic figures that tend to apply to most square and oval tables, but it is still a good idea to know the specific size. In order to determine the tablecloth size you need, measure the table length and width. Note, that this applies to square, oval and rectangular shaped tables only. If your table is circular, measure the diameter instead. Once you know the exact measurements for your table, you simply need to determine how far you want the tablecloth to fall. This fall is also known as "overhang", but is more popularly referred to in the linen industry as "drop". Any figure between six and fifteen inches is an acceptable length for the drop, but the amount you choose largely depends on the table height and even the height of your chairs. If the seats are high, you may opt for a shorter overhang to compensate for the closeness between the chair and the tabletop. If the table is on the high side, you can safely opt for a longer drop. Tablecloths may graze laps, but they should not actually fall into diner's laps. In some situations, this chart may be enough to help you determine the tablecloth size you need for your table. For example, if your circular-shaped table seats a maximum of four people, you can probably narrow down your tablecloth choice to one listed for the size of your table. However, it's always a good idea to be prepared to measure the table beforehand. The basic tablecloth size charts feature guidelines that tend to mirror one another; that is, these figures are quite accurate. That said, they are considered general guidelines, so it's wise to double-check the suggested tablecloth size against your own measurements. Tablecloths are widely available at all kinds of stores, from Big Box retailers, like Target and Walmart, to major department stores, like Macy's and Nordstrom. You will also find elegant tablecloths at specialty retailers, like Cost Plus World Market and Pier 1 Imports. As with any important purchase, take into account the store's return and exchange policy on the off chance that the tablecloth is not a good fit.